Pearl of Great Price is a parable found in the teachings of Jesus, Son of Mary, upon them both be divine peace. In the 13th chapter of Matthew, Christ goes on in great length, bringing in many parables to illustrated the concept of the Basileia tou Theou (Kingom of God) or Basileia tōn Ouranōn (Kingdom of Heaven) to his intimate companions. As part of our series: Sufi Readings of Jesus' Teaching Parables, we turn to the parable of Pearl of Great Price. The Parable illustrates the great value of the Kingdom of Heaven, and immediately follows the Parable of the Hidden Treasure, which has a similar theme. As I asked about your sharing on the Parable, I have received a number of entries with multi-dimensional insights which I wish to share with you here, with acknowledgment and thanksgiving to all of you who shared. In reading any of the ancient scriptures, the modern reader must take into account the social context in which Jesus’ message/parable is delivered. In this society, many of the listeners were fishermen and derived their family’s sustenance from the sea; everyone knew the value of pearls and how difficult they were to obtain. 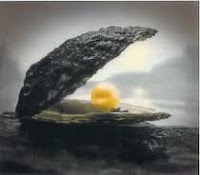 Not every oyster had a pearl and the pearl itself starts from a piece of ordinary sand/dirt (unrefined soul), taking years to develop; also, in this community the position of pearl merchant had considerable social status and wealth attached to it. Here was a merchant, trained over many years to know the beautiful, fine qualities and variety of pearls who one day found a pearl of such extraordinary rarity that he fell in love and sold everything he had to own it. Any listener would understand this must have been an exquisite, extremely rare pearl for the merchant to instantly fall in love and essentially give-up everything he worked years to obtain. This is the great prize, or spiritual journey, that Jesus calls the Kingdom of Heaven. Remember all of his audience were part of the Roman Empire, and well acquainted with living in a Kingdom, and understood this contrast and comparison; one Kingdom being harsh, restrictive and the other sublime bliss. In more modern terms, for the spiritual traveler, the Kingdom of Heaven is God Consciousness/Higher Knowledge and in order to reach this goal, out of love the traveler must give-up all their attachments, thoughts and desires. Surrendering their ego and lives to the Divine Impulse they become God’s Servant. Another way to discuss this is that the traveler’s ego/consciousness becomes annihilated and their heart becomes unified with God. In this state, the traveler and the Beloved, blissfully become One; that is the Kingdom of Heaven that Jesus describes and is the spiritual traveler’s goal. This Caress is bestowed, not earned and involves giving-up everything because one loves for the Beloved (Pearl of Great Price/Beauty). This spiritual state is comprised of extreme joy, unity, great happiness, profound peace and love. 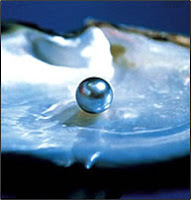 The Pearl is the symbol reserved by Christ for the Kingdom. Pearl was the most precious object for a fisherman who might accidentally discover the pearl or seek and find it. As the Lotus remains the archetypal symbol for Buddha, Pearl is for Jesus - a symbol of purity, preciousness, a goal to be sought. In some texts it is the Pearl of Immortality, Pearl of Infinite Oneness, Pearl in the Ocean of Divine Love, God Realization, God Consciousness. 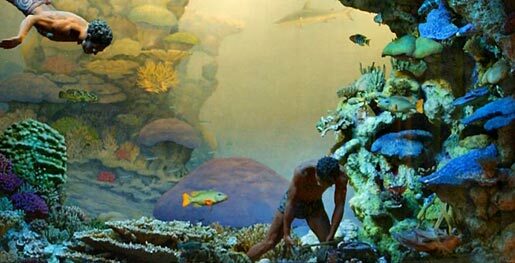 And the ‘great price’ is also about our own enormous struggle to reach it, similar to actual ‘pearl divers’ or ‘pearl hunters’. Even though there is tremendous progress that we can make on our own, after a certain point we can go no further without a Perfect Master. They are the only ones who can unlock the final stage and bestow God Realization on another. In every age there are always Perfect Masters to guide human souls, to guide humanity, including Khidr - the green man (every living) who guide the elect and ardent seekers.. Diving to the bottom of the ocean of divine life to obtain the pearl of Realization and to resurface to show the pearl to others comprises the lives of the Perfect Masters. The great mystic sage Ibn Arabi talks about the false self getting crushed, which is also a possibility in pearl diving – the body gets crushed by the pressure of the water the deeper one goes. Hafiz says that at first, when he placed his feet on the "beach," he thought he had already got the "Pearl." But little did he know that he had to face the waves, the storms and the whirlpools, and dive deep into the Ocean before getting the Pearl. He says that in the beginning he was like a man who goes down to the seashore and paddles in shallow water, and in his enjoyment, thinks he has gained the Pearl. Then after a long time, Hafiz realized that he had yet to learn to swim; and when he learned how to swim, there were the many waves he had to encounter and overcome. Then he realized he had yet to learn to dive. The next step he had to master was holding his breath under water before, at long last, he could reach the bottom of the ocean for the Pearl – the Goal. On the path, cowards have no place. 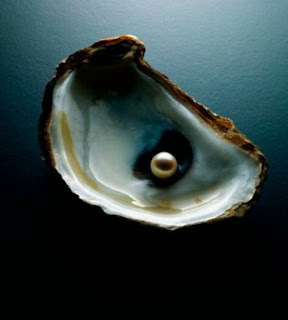 Hafiz said that when he became a lover of God, he thought he had got a grip over the "Pearl." But he never dreamt of the depth of the Ocean and the dangers to be faced from storms and waves! Then the Perfect Master comes to Hafiz's rescue. He teaches him that the "Pearl" (of Realization) is on the Ocean-bed. You have to learn to swim, then learn to dive, then find the Pearl and bring it back. After forty long years, Hafiz got the Pearl in his hands. It took forty years for him who was absolutely determined! How foolish people are who compare pearls with seashells. The real pearl is here. Do not run after shells. For one who is an aspirant on the Path, it is not seeing, but becoming that is the objective. [...] To compare the above with spirituality, take the water of the ocean as Maya, the pearl as God, the diver as the seeker, the diving suit as love, or the willingness to renounce the world, and the man on the beach or boat in charge of the air compressor as the Sadguru. Without the help of the Sadguru (Kamil Murshid) to manipulate the air compressor, it is thus impossible for one to dive down and take the pearl, which means to free oneself from the clutches of Maya while remaining in Maya. Diving for the Pearl can also be considered from a psychological level. Finding the jewels: emerald/ amethyst/ ruby/ diamond/ pearls. The perilous adventure, going through Jung's archetypes, especially dealing with the ones out of balance. The Pearl of Great Price casts a light on the gift of Jesus as the messenger of God's Love who paid the price of surrendering his life to convey God's great love for us. On a different esoteric level the making of both masculine and feminine energy as one, the being of androgyny, and that Christ is its chief symbol. In Mysterium Coniunctionis C. G. Jung writes, .. "the lapis (Self) is itself androgynous, a synthesis of male and female. It is the pearl of great price." (For every female who makes herself male will enter the kingdom of Heaven.' - Christ, Gospel of Thomas). The mystics understand the soul as feminine who longs for the Beloved, is receptive (essentially a feminine quality) - is receptive to the Divine and thus the soul can be made pregnant with God - and God is the Pearl of Great Price. If we surrender to God to guide us.... truly surrender to a God with no limits.. think what that opens up? What if we absolutely trust God where He takes us... guides us and says look at this? and this? and this? and this? How does God see it? How He truly loves everything He creates? What have we done to his divine intention? How do we open the doors? What if two or more truly learn to love it all? Do they open a pathway of energy that creates the possibility in human beings? A pearl is created by agitation and irritation and a polishing process that is very similar to our own pruning and refining to become a drop of the oceanic source of all life, a translucent light, a seed of light, a holy touch, a divine sperm, super strings, physicists called it, a moving particle - yet they change it - because they don't really know, they speculate - the pearl becomes a treasure that cannot be bought or sold, or contained. It is a pearl of great price, because it cannot be bought, we discover it when we surrender all that we are, all that we ever have been and all that we ever will be into an unlimited, omniscient, consciousness who dares to truly care about what it creates .. to welcome it. The pearl of great price is the secret of God's Love for us and ours for God - the ultimate in relationship and variation in a growing, expanding, awakening to what is ever new, ever changing, ever life-giving, ever marvelous, and forever loving and tender and compassionate and sometimes intense, passionate, powerful, and majestic - with a force that could wipe out all of civilization in one blast but doesn't, instead He is a God who saves us, because God holds us in that great Heart that consists of countless universes beyond our imagining, each particle of God is a universe, one particle, one drop, one seed, one tiny drop of light, one speck, one glimmer, one glance, one anything of God is a pearl of great price that holds the whole world in the curve of His Love and we surrender into the majesty and beauty of that embrace - anxious for the night and the morning and the sweet wonder of the first day of forever with such a Love. What a bargain, let's buy it: the Pearl of Great Price! In the follow-up post, God willing, we would like to share a Sufic Perspective on the reality of Kingdom of Heaven / Kingdom of God - how it is described, understood, realized and sought - and the Quranic perspective of the state of the merchant in the Parable of Jesus of "selling everything that one has for the purchase of the Pearl of Great Price." O Lord increase us in knowledge. O Lord increase us in awareness. Allahumma Rabbi zidni ilman bil Haqq. O Allah, O Lord enlighten us with Truth. O the Illuminator! O the Enlightener!